This could lead to the worst case scenario. Pressure tests indicate the wellbore structure may be compromised “down hole.” This means they may have to uncap it to take pressure off the well and prevent a total collapse of the well due to erosion. The possibility of this horrific scenario was explained in detail by an oil industry expert at The Oil Drum. It's a long post, but well worth your time. This expert claimed everything BP and the government were doing indicated they knew of a leak “down hole.” Although BP statements have hinted at this possibility, this information has not been widely reported. If the wellbore is destroyed, the entire 2 billion barrels (barrels not gallons) in this reserve are coming out into the gulf and there would be nothing anyone could do to stop it. So far, the oil expert's June 13th post is looking very credible. Let's hope he is wrong. However, AP is now reporting on this leak elsewhere in the wellbore and the possibility the well will have to be reopened. "No one associated with this whole activity ... wants to see any more oil flow into the Gulf of Mexico," Doug Suttles, BP's chief operating officer, said Sunday. "Right now we don't have a target to return the well to flow." 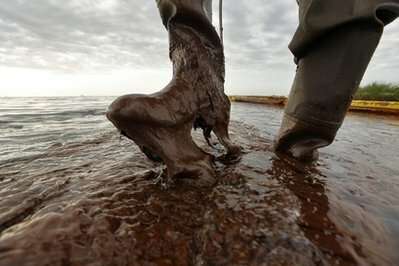 An administration official familiar with the spill oversight, however, told The Associated Press that a seep and possible methane were found near the busted oil well. The official spoke on condition of anonymity Sunday because an announcement about the next steps had not been made yet. The concern all along — since pressure readings on the cap weren't as high as expected — was a leak elsewhere in the wellbore, meaning the cap may have to be reopened to prevent the environmental disaster from becoming even worse and harder to fix. This is really scary. Less than 200 millions of gallons have leaked so far. If the whole reserve goes, that is at least 540 times the current amount of leaked oil. So, BP and Team Obama have been hiding this info all along? oildrum has been saying this all along. I think they are hiding it becasue they have a strategy of allowing terrible news out in bits over time, to alleviate panic. I would move if I lived in the Gulf. You are a fool to swim in the Gulf, with all that hydrocarbon dissolved in it. The dispersant absorbs right through skin and goes right to major organs in the human body. People will be dying from this for decades, while BP avoids blame by claiming it isnt their hydrocarbons doing it, but natural seeps. The management team should be tried for high crimes against the state, 20-30 years and even execution should be on the table. We cannot allow this to stand or our country will go down the tubes. it cannot be cleaned up. BP has left it to dissolve into the Gulf, poisoning people for decades. this is the definition of a high crime against the state. SInce BP provides some 90% of all fuels to our military what will they do? There is no justice in America anymore, since the Bush admin, and so America will fall. Thats what they dont understand. Distrust between the people and the govt relationship with corporations may even lead to destabilization and revolt. Bring justice or pay the price. Good News! Arizona Boycotts Failing!